Hand sweating or sweaty hands can be a particularly difficult and embarrassing problem for people. Having permanently soaking hands can cause people to have difficulty writing on paper without marking it, to hold pens or other implements and to shake hands without undue embarrassment. Foot sweating or sweaty feet is a normal occurrence. It becomes a problem if the sweating is excessive (hyperidrosis) as this can lead to an unpleasant odour as well as cause other foot conditions including itchy feet, toenail fungus and athletes foot. 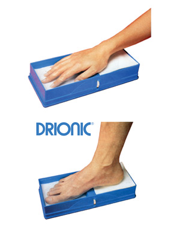 Drionic is a long established, American manufactured, iontophoresis device which has gained worldwide acceptance in its use for the treatment of hand and foot sweating. Iontophoresis is a process where ions that occur naturally in tap water are pushed toward the skin by a low voltage electro-magnetic field. You can buy directly from us at the Morehampton Clinic.